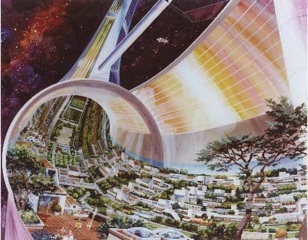 According to NASA, ‘A couple of space colony summer studies were conducted at NASA Ames in the 1970s. Colonies housing about 10,000 people were designed. A number of artistic renderings of the concepts were made.’ Here are more than a dozen of them. Ah, the good ol’ daze of Gerard O’Neill’s High Frontiers and Timothy Leary’s rallying call of SMI2LE (Space Migration, Intelligence Increase, Life Extension). This entry was posted in squifnet worthy. Bookmark the permalink. Post a comment or leave a trackback: Trackback URL.